The Visual Arts Society of Texas, formerly known as the North Texas Area Art League, was organized in 1975. VAST seeks to further community appreciation for and participation in the visual arts, provide opportunities for developing artists’ skills and expression, and offer fellowship with people of similar interests. This year, Dynasty supported the VAST 8th Annual 125 mile-radius exhibition by donating brushes to an artist with exceptional watercolor skills. VAST sponsors this annual event to offer artists—student and professional—within a 125-mile radius of Denton an opportunity to enter their work in a juried exhibition and to compete for awards. The exhibit provides an excellent opportunity for the north Texas community to appreciate the high quality and diverse nature of art produced by artists in our region. The 125-mile exhibit opened on January 17th and will run through February 21 at the Center for the Visual Arts, Gough Gallery in Denton, TX. You can view all the winners through the catalogue online as well as seeing the art in person if you're close to Denton. We at Dynasty are proud to share the work of Cate Robbins from Celina, TX. Her winning piece, "Teenage Girl's Treasures 1972" won the FM Brush Company, Inc. Award, a fine collection of several brushes from a few series, including the Faux Squirrel line. Cate shares her work with us; "[This piece] is one of a series of watercolors that are portraits of people not of their images but of what objects they leave behind when they leave the scene. In this case things that a young girl in 1972 might have just stepped away from temporarily." Cate Robbins has been a member of VAST for nine years now, and an artist her whole life. She is not only an award winning watercolorist, but a fabulous paper maker as well. You can view more of her work at her website or her painting ETSY store. Really great news to share: there are new brushes being debuted at Creativeworld in Frankfurt this week! If you're at the show, stop by our booth at 4.1 J31 and take a peek! First, the Black Steel. This brush is created specifically for acrylic and oil heavy bodied paint. It is a very strong synthetic blend of hair, interlocked by our propriety process, and these brushes are completely made by hand by our master brush makers with 20 + years of experience. The ferrules are black chrome, triple bonded to the non-reflective, precision balanced handles. Completely suitable for outdoor use, plein air work or even murals. The line includes several shapes and sizes, including the Patented Wave shape. This brush is an affordable alternative to natural bristle. I will certainly share more information with you once I get to try my hand with them. Secondly, we're bringing along a range of new shapes to the Faux Kolinsky line. This is huge for those of you that love these brushes. So far, they have only been in rounds, but now there are ovals, liners, flats and spotters. Since these brushes are ideal for water media like gouache and egg tempera, these new shapes will bring more variety to the studio. There are a range of sizes in these new shapes, too, so look out for these coming to retailers soon! I will keep you posted on when and where they are available. Retired teacher and Pennsylvania artist, Cheryl Schlenker, painted throughout her teaching years as a hobby, but came back to painting full force upon retirement. Taking classes at the local art center gave Cheryl inclination to try watercolor, though at the time, she felt more in control with acrylic. However, Cheryl took time to get to know other teachers and students over several courses and years, and found a mentor-artist in Nancy Barch. "I was introduced to liquid acrylics and how to stretch both watercolor and acrylic to their advantage, even add the elements of collage, pastel, and pencil. This suits my style because I love drawing, and the superimposing line on paint is exciting to me, she shares. "I keep a rolling cart full of watercolor paints, acrylic paint tubes and bottles, pastels, colored pencils, charcoal, collage materials, gel mediums, inks, water soluble pencils and crayons, and gesso. I love working with different combinations of these items and am always discovering new effects." 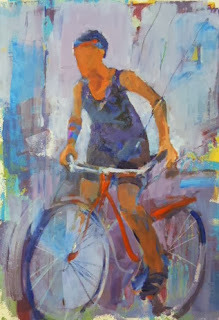 Cheryl works in the values of the composition, abstracting the shapes of her subject, while maintaining their reality. Her vivid and poignant style reflects the work of master painter Paul Cezanne, while also mirroring modern subjects and the natural world around her, keeping her work beautifully representational. Cheryl's work lends itself to large flat brushes, for the bright shapes and thin lines as well as loose washes she creates. While Cheryl spends at least 2 days a week painting with others in a group studio, she also fills her time as the current Philadelphia Watercolor Society President, where she is able to meet other great painters and support artists in her community. She is also active in the Cecil County Arts League, the Chestertown River Arts, and the Pennsylvania Watercolor Society among others, so she keeps busy entering group shows and traveling to paint and exhibit. Casino, oil on Dura Lar film, 3 1/2" x 5 1/2"
Manhattan Arts International had it's third juried exhibition opening in December with the show Small Art, Big Impact. As a sponsor of the event, Dynasty chose an artist from 60 finalists to win the Dynasty Brush Award, a treasure of $200 worth of brushes from a range of our series. 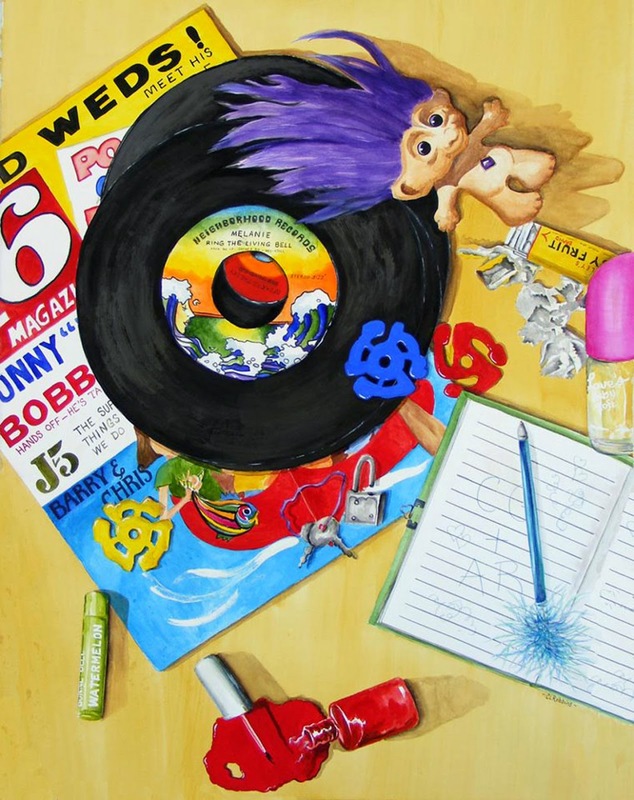 The winner we chose is Debra Keirce, a wonderful realism artist, who paints in very small scale. Her piece Casino won for its original subject and accurate detail, but also because the size is ultra-impressive. The image you see above is actually larger than the artwork itself. Debra has always considered herself an artist, and knew from entering and winning her first painting show that she would always be painting. When she graduated from high school, Debra had a scholarship to Cranbrook Academy of Art, but didn't find the modern art world appealing. She shares, "I didn't want to learn cubism, expressionism or any other 'isms'. I just knew that I wanted to draw and paint the world as I saw it. I was told that I should consider myself an illustrator then - not an artist." So, her career as a representational artist unfolded over a few decades, while she pursued a career in biochemical engineering. She started out painting a few commissions a year, and then built up that business while raising a family. In 2010, she began entering her work in shows and developing her portfolio. At the end of 2012, Debra began pursuing galleries and likewise found some pursuing her. Even though Debra began her work as an artist in graphite and charcoal, an ideal base for drawing and realism, when she started incorporating color, acrylics were ideal for her technique. She could achieve the bright hues and quick drying time, which she needed in her layers. Alkyds also worked well for her as they blended smoothly like oils, but dried much quicker. She explains, "Likewise, with the new acrylic mediums on the market, I could slow the drying times for my acrylic paints a big, and buy high flow paints that apply like watercolors or oil glazes - all without sacrificing the high chroma I enjoy. So whether it is acrylics or oils I am working with these days, I can use the same process and techniques." Debra's work might be small, but her brushes of choice are often not very small. Her favorite is a #6 round, giving her the sharp springy point and holding a rich amount of fluid. "People assume I pluck hairs out of caterpillars and paint with them. . . not true. I actually prefer a watercolor type brush that holds a great deal of paint. The important thing for me in a brush is to have a very pointy tip that springs back again and again. So, my favorite brush is a #6 round. I can flatten it and use it like a filbert, or drag the point like a liner. Of course, for parts of my paintings, I will use smaller rounds and flats, and initially, I will use larger flats to lay in the ground." The Scholar, 5" x 4"
For Debra's brush award, she will be getting Black Golds, Faux Squirrels, Microns and some Mastadons as well as few from the IPC line. Congrats, Debra!